When new construction builders develop new neighborhoods and floor plans, they often hire interior designers to set up a model home. This infographic, provided in conjunction with Rave ReViews Home Staging, out of St Augustine, FL, shows that builders may be better off hiring professional home stagers. 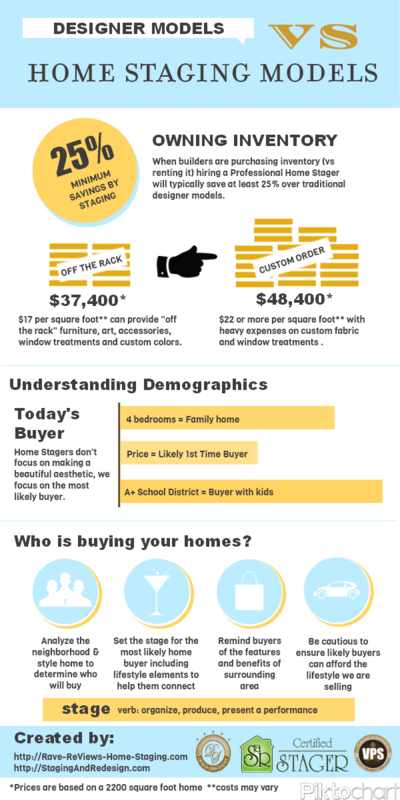 Using home stager vs an interior designer, new home builders could save 25% or more on model home costs. The difference in costs of home staging and model home staging may be more than $11,000 in this simple price model. Of course many model homes actually run well into $60,000 or more, adding to the value of a home stager. To learn more about the differences between a designer model and staged model, visit my Active Rain blog, or watch my YouTube video. of course one should hire professional interior designers to make their home like dream home.